The Workbook section offers abundant mechanical practice as well as communicative activities. 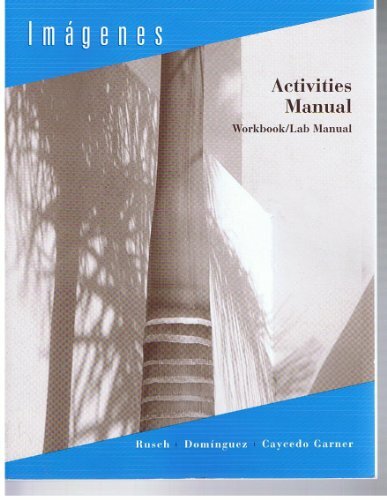 The Lab Manual section is keyed to the recordings on the complete Audio Program, with abundant listening comprehension activities, and pronunciation practice. A separate answer key is available so students can track their own progress. Debbie Rusch has been the coordinator of Elementary Spanish at Boston College since 1990. She is the author of Im?genes, ?Claro que s? !, Fuentes: Conversaci?n y gram?tica, and En parejas 1, 2, 3 y 4. At Boston College she teaches pedagogy courses. She has been an instructor of Spanish for more than a quarter of a century and has also taught English as a Foreign Language in Spain where she lived for more than six years. She is a frequent presenter at state, regional, and national conferences and conducts workshops for school districts.